Spreadsheets vs. SharePoint, Which one Manages Data Better? Having and maintaining accurate, up-to-date employee data is crucial in the construction business. If your business is rapidly growing (like so many other construction companies in the Dallas area where HingePoint is headquartered) and you’re onboarding employees, vendors, and contractors, accurate data on who your employees are and what they are working on is critical for success. Although it sounds like a simple task, project management for construction companies can be quite challenging and lead to more serious issues if not managed properly. Many of our clients in the construction industry previously used Excel spreadsheets to manage their financial data, employee data, project status, and assets. Some were using old versions of SharePoint with unorganized data. When working with software and older systems, data about employees are prone to be full of errors (out-dated and inaccurate). The trick is to get up-to-date, accurate information out of your data management system instead of old, error-prone data. Spreadsheets are great tools for handling smaller and more manageable datasets. But what happens when you start hiring 10, 100, or even 500 employees at a time while managing employee data in a spreadsheet or in multiple, unstructured databases? It gets unmanageable - fast. 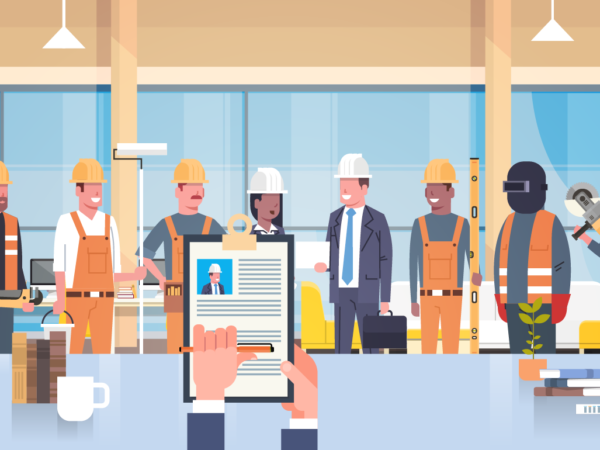 As your construction business grows, more departments need human resource employee data because more information is attached to each employee. And soon, just having the right name, address, phone number, and social security number across the enterprise become more challenging if you don’t have the right controls and organization. If this data is in an actual spreadsheet, then anyone can enter and change data in that workbook. For example, a manager could get access to a Human Resource spreadsheet with employee names and other important information. Let’s say the manager has an employee named Suzanne, but she likes to be called Suzy. The manager changes the data because they can and there are no restrictions preventing it. But there is a big problem. Now the source data – the system of record – is not consistent/accurate. Suzanne will be called different names in different versions of spreadsheets. Throw time in there, too. Perhaps “Suzy” is a contractor who is keeping her time in a spreadsheet that gets sent to her manager. The manager sends Suzanne’s hours and all contractors to Human Resources so they can get paid. The manager’s project data is being merged with HR’s data. The problem is that we have two different names in the system. “Suzanne” and “Suzy”. No VLOOKUP formula or Pivot Table is going to solve this. It’s going to take someone to manually go in and fix the data. This might not seem like a big deal, but as the company grows, these smaller errors will multiply in other departments. Once this happens, the employee data cannot be trusted, and it will take a lot of manual work to fix the errors each pay period. The data problems can become so big that businesses end up just not trusting their data, causing a lot of rework, manual data entry, etc. A lot of construction companies we work with the hope that the software an IT company is going to install will solve the data problem. Unfortunately, this just adds another layer of complexity to the original problem. The problem that needs to be solved is how you're going to clean up your data, actually collecting it, and then showing it in a way that lets you see the data in a new light. Ideally, you want to make decisions with information that automatically reports to you. Seeing year-over-year and month-to-month views of data can quickly identify trends. With the right devices collecting the data and the right systems transposing it into information, humans can focus on making strategic decisions that will make their customers happy. That is how technology should work. And that what HingePoint can help you acheive! If you're looking to solve your company's HR and Project Management employee data problem, we'd love to hear what you're looking to accomplish! Feel free to start a live chat with our solution consultant on this page, email us, or call us at (214) 301-0000 to get started today. [post_content] => We interviewed our lead Project Manager and SharePoint expert to see the difference between Spreadsheets vs. SharePoint. If you’re managing your data in spreadsheets right now, that's probably not the best option for you. A spreadsheet is essentially just a dumb piece of paper that you're writing on. If you import the data that is in a spreadsheet into SharePoint, you will be able to manipulate the data in different ways, create different list views so you can see your data in different ways. You can connect SharePoint to multiple other external systems through Integrations, create workflows that speak to other places in SharePoint. Now you have smart data that can be easily merged and visual,  instead of data that is just sitting in a spreadsheet. We see a lot of businesses managing all their data for their clients or for their customers in tools like Smart Sheets, Excel or the Google applications. These tools are essentially a shared Excel file without a lot of process automation or integration with other tools. SharePoint is easier to use because it puts all those different tools on one platform and it's a central hub where you can find and do everything needed for your daily routine. If you move over to SharePoint and house your data there, you can create workflows and integrate with other systems that you have throughout your company in different departments and manage data better. It flows seamlessly through your business processes instead of being dissipated in other systems of record. SharePoint is also a good tool because it can be used as a customer's system of record. For instance, we’re helping one client right now manage all their employee data. They have this data in several different systems and it has discrepancies in it: different addresses, different names, capitalization errors, etc. SharePoint is their only system of record now, and all that employee data is held and kept there. We also built discrepancy reports using Power BI,  which compares the data from SharePoint to the company's other systems. We know that SharePoint is the system of record where that data actually lives and we can fix the errors that are in the other systems. If you’re using a spreadsheet to manage your company's data, we strongly suggest SharePoint because that data can automatically be pushed to other systems, it can create workflows, and SharePoint can create integrations with external systems that you may have, and give you better insight into what that data actually means. [post_title] => Spreadsheets vs. SharePoint, Which one Manages Data Better? Are spreadsheets good for managing data? Excel is great for what it does with data. You can even connect Excel to data visualization software like Power BI. A lot of companies use Excel to create pivot tables, look at line-item lists and build graphs. But some businesses rely on it way too much. If you’re running large data sets or entire projects in Excel, then you might want to consider what you are missing with a tailored solution that can give you more accurate data more of the time. In Excel, anyone can update a spreadsheet who has access to it. It’s just a spreadsheet that someone updates by hand. However, if you are using a database and a platform like SharePoint, only people with the proper permission can edit fields. Whereas in a spreadsheet, anyone who has the spreadsheet can edit whatever they want. If you have all your financial data in Excel, why would you let someone who is not in accounting make official edits to financial data? There are no controls on the data in a spreadsheet. If you are using Excel, chances are your data is not automated, which means data is not flowing from software that collects the data to the software that projects that data with visualization tools. If a data transfer is not automated, then guess what? You are doing data entry and copy and pasting cells. Not only are you wasting extra time and resources, you risk making errors with your data. Check out our story on why your data is not accurate. Humans enter data into the Excel fields. With every human task, there are inevitably errors that will be made with data entry. Even a hidden decimal or hidden row can cause your entire excel sheet to be inaccurate. With a data entry process or the right enterprise-level software, you can control what data you enter with checkboxes and dropdowns. This limits possible entries and errors.